Made for a boy and his dog. Lucky dog, lucky boy! 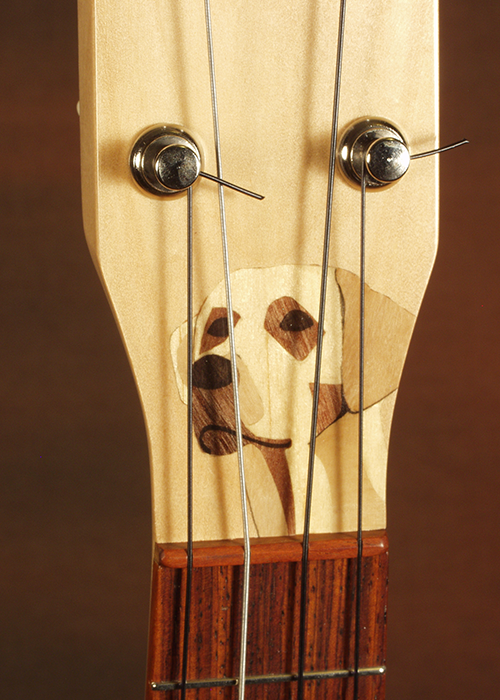 This is an all wood inlay I executed into the peghead from a picture of the dog named Yhatzee the Washington DC owner of this instrument provided me. Needing another subtle touch to round out the composition I inlaid dog bone fretmarkers as a useful and whimsical touch on the instrument. Note the koa stripe which runs down the neck and continues around the body.